The BG Unda Expert Advisor trades based on the Bollinger Bands indicator. The default settings are designed for trading on the M15 timeframe. With these settings, the EA operates in the classic night scalper mode. Description changed 08.03.2009: all old set files are not suitable for working on real accounts. Starting from March 11, 2019, trading will be conducted only on three currency pairs: AUDCAD, EURAUD, AUDUSD. Over time, I do not rule out the possibility of disabling the AUD USD pair as the least profitable. NOTE! The default settings and proposed set files are designed for brokers working according to Eastern European Time (EET), thus covering most well-known brokers. If your broker has another terminal time, change the EA operation time manually. The settings are for five-digit quotes. Recommended account type - NDD, ECN. 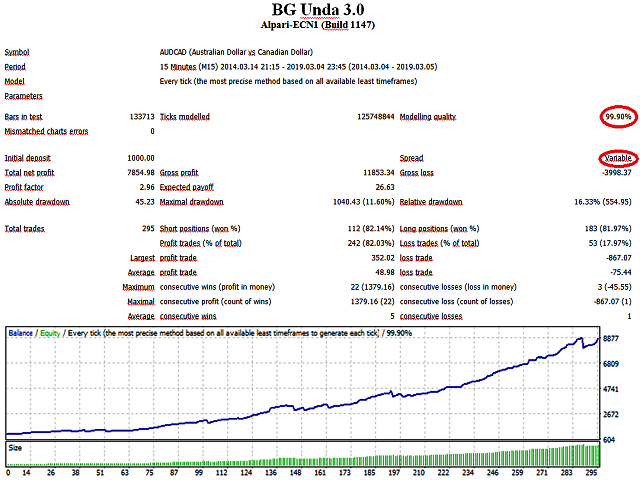 I've been a long time user of BG Unda and it has proven to be very successful, particularly the latest version 2. I am selective of the symbols, thanks to Boris for providing honest results on live accounts for us to observe. Thank you Boris for this EA and for being responsive to suggestions. I've been following this EA since few months, actually I'm testing it in a demo account in standalone mode and it's a very safe EA, doing around more than 10% profit on one month with a drawdown around 4%. Boris seems to have enhanced is EA, he has done a great job, when people were arguing about huge losses last year, he has take in account the claims and has modified is EA for avoid the same issue. After a month using it, I recommend this EA. An EA that can earn 10-15% in a month, can not lose 80% or even 100% of the account in a single night, in two hours. The risk benefit is very unbalanced. According to author, although the SL are of 1000 pips, the system would close only by other parameters. IF I do not get to cut the trades I blow the whole bill. It gives benefits on a regular basis, but very little compared to risk. Today, August 29, 2017, that's just happened. Accounts have been lost and some have been greatly diminished. A strategy that seemed good, in the end lacks something very basic. RISK CONTROL. You can not put 5 currencies with 1000 SL each, and do not have a loss control. Right now I do not recommend this EA. Sorry for the author, but the losses are ours. We buy and pay for finished and tested products, we are not test rabbits. After the last update of the EA and the great work done. Now it is safer than before and maintains the benefits. Boris has done a good job and deserves the 5 stars again. "Отличный советник, отличная поддержка от автора". I had given a vote of confidence again to this E. After several gains, I lost everything and a little more in one night. Unfortunate. I originally did leave an amazing review here for Boris and I still do believe that this can be a very profitable EA but there is work to be done and until we as customers see this work and the results in action then I think its only fair that I down grade my review. Sorry Boris but we have all lost decent money and this hurts all of us.. I dont know how good is is or not but i get one thing for two week i use it i have maybe 10-15 % PRIFIT and only for one single night i get 20 % loss,i don't get it.I want to ask how it's possible this.All the post i read noone say anything like that.Can someone explain it to me this? The developer is always quick to respond. No complaints at all. 5 stars for me. --- Updated to 2 stars. One night can easily wipe out many months of positive gains. Typical Asian scalper asymmetrical negative R/R ratio (few pips gained, hundreds of pips of downside potential). The EA can open multiple highly correlated positions at the same time, and if all approach the SL, the account is toast. A filter where a maximum number of concurrent trades is activated would somehow tame this dangerous strategy. Wins and losses on my IC Markets real account. But mostly losses. I give it two stars because it at least keeps the losses small. Fantastic EA. Very safe & Very Profitable! Hi traders, great expert advisor from Boris. Pls do not believe me what I said. You have to purchase it and see for yourself. Keep it up Boris for the great work and contiune to improve your Expert Advisor. I run BG Unda for 6 months Live, since December 12, 2016. It makes me real money! The author is constantly improving the EA and it works more stably now. It looks that I am going to earn even more money with it in future. I can really advise BG Unda. Many thanks to the author! After 2 weeks i must say just Amazing! Stable profit every night and low risk. This EA is definitely one of my favorite ones. Very satisfied for now, 5 starts for the results and support! Very good EA, it works profitable on a live Account. It`s very safety and the Seller is very helpful by any questions. So far so good and BG got nice support to his products. The "Block Trade Symbol"parameter has been added in 3.0. If "true", multiple orders for currency pairs containing the same currency cannot be opened at the same time. For example, if an order for AUDCAD is already opened, the EA will not open an order for the pair, where there is either AUD or CAD until an already open order for AUDCAD is closed. 1. Changed parameters for setting the trading time. It is now possible not only to select the time, but the day to trade as well. 2. Added the option to disable trading in the last three days of each month. 3. Changed the maximum spread filter. 4. Added a limit on the number of simultaneously opened orders. 5. Added a limit on opening orders at the specified level of drawdown by free equity. Modified the operation algorithm of the news filter. In version 1.2, added the ability to start trading on Monday at a certain time. Using this parameter will help cautious traders who do not trade in the night from Sunday to Monday. Added the ability to change the comment to the EA's orders. Added news filter. Works using a separate indicator. Allows avoiding possible losses during high-impact news and high market volatility. Added the parameter to close orders opened on Friday at a certain time. It is also possible to disable trading on Friday. The new potions allows to avoid possible losses during gaps at the opening of the market on Monday.